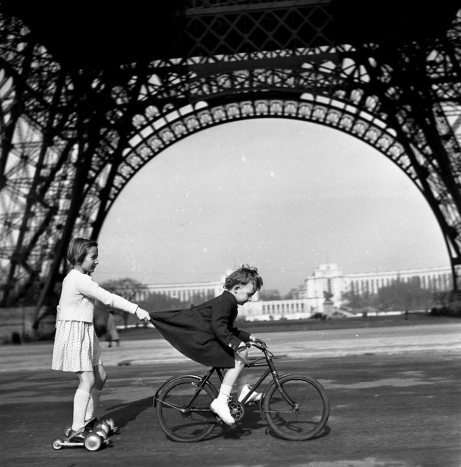 Orphaned by the age of seven, Robert Doisneau was raised by an unaffectionate aunt. Perhaps this lack of love contributed to his seeking of whimsy, humorous juxtapositions and romance while contrasting his insight into the frailty of life. But before Doisneau’s career could bear fruit, the man would need to get over photography’s version of stage fright. At the age of 13, Doisneau enrolled at École Estienne, who exposed him to his first artistic endeavors of figure drawing and still life. After three years, he was given diplomas in engraving and lithography. Around the same time as his graduation, Doisneau first became interested in photography. However, the act of actually photographing someone was quite daunting for the man. Allegedly, he started small by taking pictures of cobblestones. From here he moved on to children. Finally, he began to photograph adults and never looked back. By the time World War II rolled around, he was shooting people both literally and figuratively while enemy soldiers exposed him to more than he ever had to fear as a civilian. Stylistically, Doisneau related well to fellow countrymen Henri Cartier-Bresson and Eugene Atget, plus France’s adopted son Andre Kertesz. His photojournalism often captured images at just the right moment ala Cartier-Bresson, while his artistry and love for Paris followed suit with the latter pair. Doisneau’s shyness was often beneficial as well, since his oft-unaware subjects were seen in a more candid light. 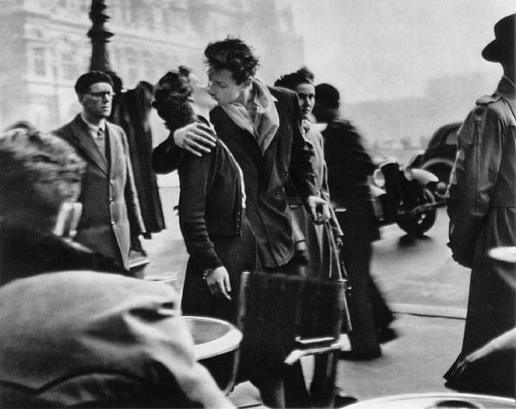 Ironically, Doisneau’s most arguably famous photograph, The Kiss by the Hotel de Ville, was quite deliberate. After observing Françoise Bornet and Jacques Carteaud kissing, Doisneau asked them to do so again in three different locations, including near the aforementioned Hotel. The photo was published in Life Magazine and became international symbol of Parisian young love. Over the course of his lifetime, Doisneau’s true love was street photography. But in addition to this work he dabbled in numerous other realms, including celebrity portraiture, advertising and children’s books. During the majority of World War II, Doisneau used all of his skills beyond photography to forge passports and papers for the French Resistance. Unfortunately, his love of Paris dissipated as the city evolved. According to Doisneau, “Cement (had) replaced the plaster tiles and wooden hutments. There’s nothing to catch the light.” The magic would be gone altogether when Doisneau departed the world in 1994.